VANCOUVER, BC--(Marketwired - Feb 1, 2017) - Speed was key to success for retailers during the 2016 holiday shopping season, according to a new report from mobile commerce expert Mobify. Retailers that want to compare their brands' mobile performance and learn actionable insights to improve mobile conversions can now download the latest 2016 Q4 Mobile Commerce Insights Report. The free report analyzes shopper data from large retail ecommerce sites to help merchants understand where, how, when, and why mobile consumers engage in order to make the largest business impact through mobile engagement. The 2016 holiday shopping season was the first time mobile engagement surpassed desktop, with mobile traffic up 15.8%, while desktop traffic decreased 13.4% during the October 1 - December 31 timeframe tracked by the report. Retailers with websites optimized for mobile were at a real advantage in turning traffic into revenue, the report states. Since it's widely known that sites optimized for mobile are fast, Progressive Mobile websites -- which are two to four times faster than responsive or m.dot websites -- stand to gain most. The report also recommends brands focus on checkout optimization, where they can implement user experience enhancements like streamlined forms, free shipping messaging, and one-touch web payments to speed shoppers through the purchase process. It's long been known that shoppers turn to phones on weekends and holidays and this holiday season was no exception, with data showing mobile traffic increased 8.5%, while desktop traffic decreased 16.3%. The "weekend effect" was amplified over the holidays, with 57% of traffic on Christmas Eve and Christmas Day coming from mobile. Viewing retailer websites on a screen that fits in the hands, with the ability to tap, swipe and navigate through the shopping experience, is considered job one for online merchants. 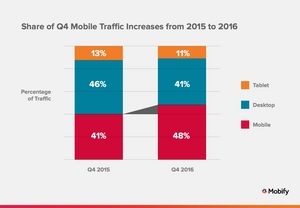 But how can brands convert this mobile traffic into revenue? With Progressive Mobile, the shopper experience is fast and engaging to ensure customers don't drop off before completing the checkout, the report suggests. Further, retailers can adapt their website design to customer behavior and expectations throughout the shopping journey, with best practices such as checkout flow optimization to significantly increase conversions. "If you followed the news in retail, the 2016 holiday season was a winner for some and a disaster for others," said Julie Gunn, vice president of customer success at Mobify. "We compiled these benchmarks from the large volume of shopper data amassed through our customers to provide key learnings from 2016, as well as insights into best practices that can put retailers on the winning side." Mobile overtook desktop this holiday season. E-commerce sites with Progressive Mobile technology are optimized for mobile conversions.